Guitar Center will take its iconic “Legends Collection” on the road beginning May 23 for a 4-city tour that will make weekend stops in Fountain Valley, La Mesa, San Francisco and Hollywood. 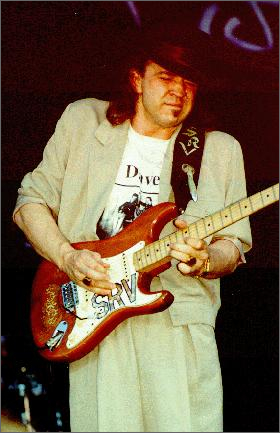 The “Legends Collection” will feature three of rock’s most famous guitars – Eric Clapton’s “Blackie” Fender Stratocaster and Gibson ES-335, as well as Stevie Ray Vaughan’s “Lenny” Fender Stratocaster. 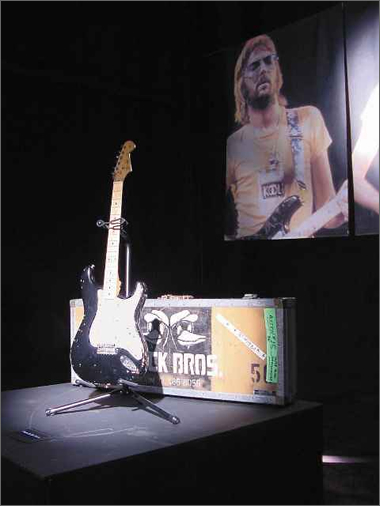 Purchased for over $2.4 million from the Clapton Crossroads Centre charity auction at Christies New York in 2004, these three guitars are among the most treasured guitars in rock history. Assembled in 1973 by Eric Clapton himself from the parts of several guitars, Clapton played “Blackie” almost exclusively on stage and in the studio from 1973-1985, recording hits such as “Cocaine,” “I Shot The Sherriff,” “Wonderful Tonight,” “Further On Up The Road,” “Lay Down Sally” and various live versions of “Layla” as well as being featured on several album covers and videos. His Cherry Red Gibson “ES-335” was used to record Cream’s versions of “Badge” and “Crossroads” as well as many other historical performances during the 40 years he owned it. Home to the largest collection of vintage instruments in the nation, Guitar Center is also proud to showcase a hand-picked selection of its most rare and sought-after vintage guitars as part of its Vintage Road Show. With Vintage locations in Hollywood, Nashville and Manhattan, Guitar Center’s vintage collection includes hundreds of the rarest and most valuable guitars, amplifiers and other instruments, including an impressive assemblage of ’50s and ’60s Strats and Les Pauls, handcrafted archtops, Jazz Basses, P-Basses and more. What’s the basis for that claim? Certainly there are many vintage collections out there that would appear to be larger. I know of one personal collection that has over 1600 pieces. Let’s not make claims that cannot be proved. Thanks.